Lakshadweep, formerly the Laccadives, is a group of islands situated some 400 km off India's west coast in the Arabian sea. They are India's only coral atolls and geologically a part of the same chain as the Maldives. 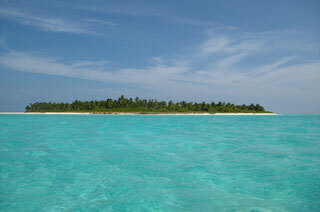 Lakshadweep is one of the most beautiful destinations that you could visit during your holidays. This union territory of India is in the Arabian Sea and consists of twelve atolls, three reefs and five submerged banks. The beautiful marine life, the villages, the tourist resorts and the mosques are great attractions for the tourists. This article uses material from the Wikipedia article "Lakshadweep Islands", which is released under the Creative Commons Attribution-Share-Alike 3.0 License.